Screen Printing is a decoration method that uses woven mesh, in most cases composed of polyester, to support an ink-blocking stencil of a design on a screen. The stencil forms open areas of mesh on the screen that allows a squeegee to move across the backside surface applying pressure and forcing ink through the open areas leaving a clean cut image on the surface of the material. This printing process is used to decorate a wide range of products and materials with a few constraints. These constraints include imprint size and placement limitations, print medium to fabric composition friendliness as well as multiple print medium combinations. Plastisol Ink: This is the most common and universal ink used in textile decoration. Its PVC based properties make it convenient and an easy to manage option. More then 90% of the time it requires no additional preparation and is ready to use straight out of the container. Since it has little to no solvent the only way it can be cured is at a high temperature of around 350 F, it is able to sit still at room temperature without the possibility of drying out. That characteristic helps reduce waste by allowing leftover ink to be returned to a container and reused on future projects. Its versatility and friendliness with a wide range of materials allows it to be a standard ink for just about all fabric compositions. Its capability of achieving vibrant opaque imprint colors on both light and dark surfaces make it an ideal choice for any and all imprints. A downside to plastisol inks is its heavy handed feel. Since the ink cures on the surface of the fabric it adds a layer of texture. It can be made softer with the use of special additives (plasticizers-phthalates) or if desired even heavier with the use of coarser screens or by adding extra layers of ink. Additionally, since plastisol ink is a thermoplastic, it will remelt and smear if it comes in contact with anything hot enough. High Density: This technique results in a more raised, thicker imprint compared to the standard application of plastisol. This is achieved by adding additional layers of emulsion to a screen. The thicker the emulsion layer, the thicker (or more raised) the resulting ink layer will be when applied to a product. This is a popular technique used to help give depth to specific areas of an imprint. Puff/Expanding: This additive helps expand the the ink it is applied to by raising it up off the surface of the garment creating a 3D look and textured feel. The difference between this technique and high density is that this particular additive is unable to achieve sharp edges and is strictly limited to rounded ones. Glitter/Shimmer: Metallic flakes are suspended in the plastisol ink base to create a sparkle effect. Usually available in gold or silver but can be mixed with other desired colors as well. Water-Based Ink: This medium although a bit trickier to use and much less versatile then the standard plastisol ink, is desirable due to its soft hand touch. This soft hand touch however is constrained to use with 100% cotton and white/light colored garments unless mixed with a discharge agent (see below). It has and can be used with cotton/poly blended garments but is unable to achieve as clean, crisp and durable of a print. The main reason for that is due to the water-wicking characteristics of synthetic fibers. Most water based textile inks are composed of around 80% water and only 20% pigment. In order for the ink to properly cure, the water and pigment need to penetrate and be absorbed by the fibers allowing the pigment to soak in and remain there even after the water has evaporated during the curing process. The curing process requires a temperature range between 330 - 350 F, depending on the amount of time it is exposed. The penetrating characteristic of water-based inks makes it ideal for printing on high nap fabrics, uneven surfaces such as seams and over zippers as well as in conjunction with other specialty screen printing embellishments that are unable to overlap with plastisol (i.e. foil). Some other disadvantages of this medium are that it is prone to drying out at room temperature which can be wasteful as well as harmful to screens. There currently are water-based inks on the market that are composed of more pigment and less water as well as an addition of a petroleum based co-solvent to help decrease the time and heat necessary to cure the ink. Those additives and refined formulas have proven to be more successful on with use on polyester and nylon but are about 3 times more expensive then standard water based ink systems. Discharge: This is either a stand alone medium used to remove pigment/dye in cotton fabric or an additive to both water-based and plastisol inks. Its use as a stand alone medium is typically an alternative to a plastisol under base, removing the pigment from the entire area of the imprint on a garment. Its use as an alternative to a plastisol under base helps to reduce a layer of added ink thickness therefore softening the hand of the print when using plastisol. It plays the same role but in a slightly different way when used as an additive with water based and plastisol inks. It removes the pigment/dye within the garment while at the same time replacing it with the desired color ink in which it is mixed. 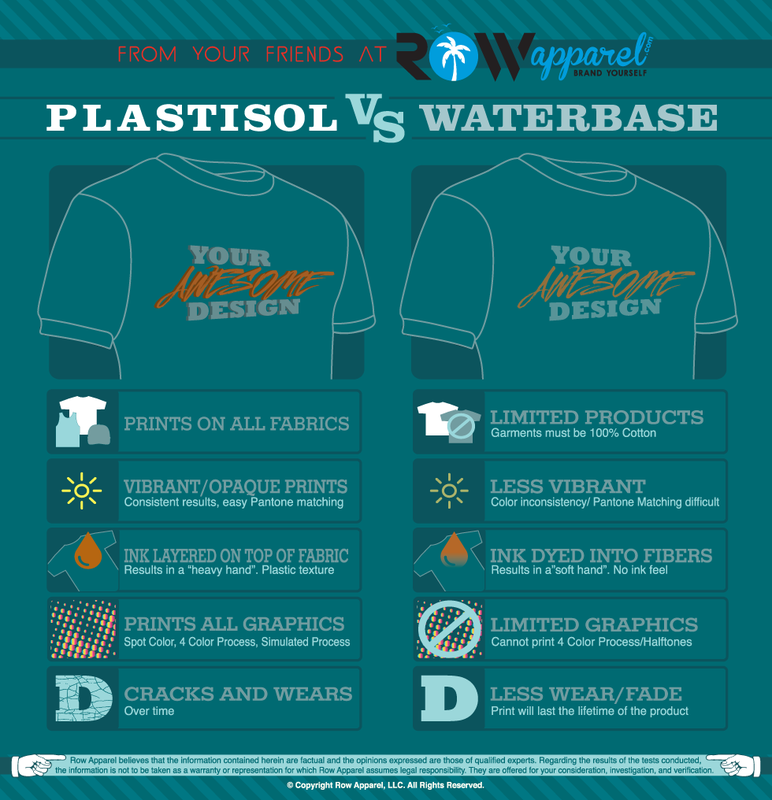 Plastisol ink also requires an additional additive called plasticharge when mixed with discharge. Not all garments dyes are discharge friendly, those that are will be tagged in our catalog. Another thing to keep in mind is that matching exact PMS colors with the use of water based inks is difficult to achieve due to varying characteristics of cotton and garment dyes used in the manufacturing process. Foil: This print medium is a two part process that results in a metallic, reflective finish. The first step involves printing and curing a layer of plastisol based adhesive. Once the adhesive is cured, a sheet of foil is draped over the adhesive and applied using a heat-press (similar to a very large iron). Once the heat pressed area of the product cools down the sheet of foil is slowly peeled away, leaving the adhered portion behind. The foil sticks only to the adhesive, leaving a shiny, metallic sheen that cannot be achieved with standard screen printed inks. Foil comes in an assortment of colors, the most popular being gold, silver and bronze. An overlapping combination of a plastisol ink and foil is not possible as the foil will adhere to both the adhesive and plastisol ink. Water-based inks can be used in combination with foil (including overlapping imprints); however, limiting it to only 100% cotton garments. Flocking: This is a two step process resulting in a raised velvet textured finish. The first step consists of screen printing a plastisol adhesive followed by the application of small bits of rayon fiber. An electrostatic tool is then used to raise the fibers upward away from the fabric surface adding a velvety texture and depth to the imprint. Burnout: This print medium uses an enzyme based chemical to remove natural fibers (typically cotton). The chemical is applied in the same fashion as other screen printing mediums. It is then passed through a dryer which activates it causing it to burn away the natural fibers leaving only synthetic fibers intact. The garment is then washed to remove the natural fiber remnants and enzyme chemical. The resulting imprint is defined by the absence of natural fibers which creates a semi-transparent look. It is recommended that this technique be only applied to garments with a fiber composition of no less then 50% and no more then 70% cotton. 4 Color (CMYK) Process Printing: This is a screen printing method used to print high color count graphics such as photographs. 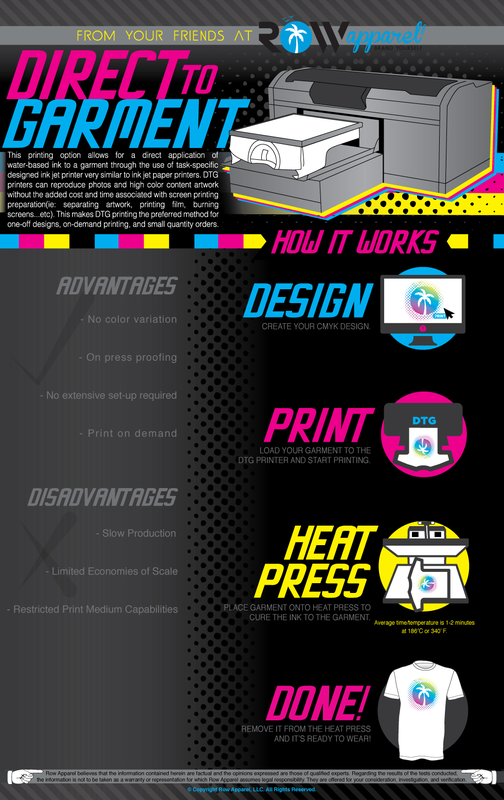 The process uses cyan (C), magenta (M), yellow (Y), and black (K) to simulate colors on the CMYK color spectrum. Lighter and darker shades of colors are achieved by increasing or reducing the percentage of one or more of these four inks in certain overlapping areas. For example, blending yellow (Y) and magenta (M) will yield red where the shade of red is controlled by the degree of overlap and percentage of each of the inks being applied to that certain area. Before printing, percentages of each of these colors need to be separated out and designated for all areas of the imprint in order to achieve the proper color shades and tones throughout the imprint. This technique requires the use of tightly woven screens as well as translucent plastisol "process" inks in order to properly and accurately achieve desired colors. This technique is constrained to use with strictly plastisol inks only downsides of this technique is that it is only able to be done using plastisol ink is in some cases it compromises the vibrancy of the imprint due to the lack of solid spot colors being used. Simulated Process: This screen printing technique is used on high color count imprints strictly using spot colors and halftones to achieve a high resolution look. Much of this process is reliant on the complex color separation of the artwork performed by the graphic artist prior to printing. Most simulated process imprints require anywhere from 8-12 individual spot colors in order to achieve a desired outcome. This technique allows the use of both plastisol and water based inks. Simulated 4-Color Process: This screen printing approach is the combination of both 4-color and simulated process techniques. It allows you to achieve the best possible imprint outcome for high color count complex images and designs that can not be accomplished with the use of just one. This approach starts with the 4-color process separation and adds complementary spot colors to help accentuate certain colors and areas of the imprint. Due to the 4 color process technique, this is restricted to the use of plastisol inks. Digital/Direct to Garment (DTG) Printing: This printing option allows for a direct application of water-based ink to a garment through the use of task-specific designed ink jet printer, very similar to ink jet paper printers. DTG printers can reproduce photos and high color content artwork without the added cost and time associated with screen printing preparation (ie: separating artwork, printing film, burning screens...etc). This makes DTG printing the preferred method for one-off designs, on-demand printing, and small quantity orders. The downside of DTG printing is its slow production speed, high operating costs, and restricted print medium capabilities. At low production quantities, DTG printing is typically cheaper then screen printing, especially if there are a lot of colors involved; however, as the production quantity increases, screen printing becomes more economical. The downsides to DTG printing are why screen printing methods still lead the apparel customization industry as the preferred printing method. It is common to mix the DTG printing with either screen printing or embroidery when, for example, custom names and numbers are required for personalized products. Due to the use of strictly water based ink, 100% cotton garments will yield the best and most durable results. Cotton/Poly blends can be used but it is not recommended with less then a 50% presence of cotton. Embroidery: This decoration method uses a needle and thread to embellish products with desired graphics. Contemporary embroidery is stitched with a computerized embroidery machine using graphics created by standard graphic art programs (ie: Adobe Illustrator) that have been converted into machine code through the digitization process. Embroidery is arguably a more refined embellishment when decorating higher end, thicker garments and products but its limitation of achieving fine details normally results in the adaptation of a design or choosing to use a different decoration method. Puff: This is the addition of foam beneath the thread and above the fabric which when stitched over a portion of the embroidered graphic gives it a raised 3D look. This is most commonly seen on professional baseball hats. Tackle Twill/ Applique: This is made by cutting fabric to a desired shape (typically using a precise computer controlled cutting machine, aka: plotter) and embroidering the cut fabric onto a product. Tackle twill can bring a bold look to your product while reducing the stitch count and in most cases the overall price. Tackle twill designs are usually simple (ie: Greek letters on the front of a sweatshirt as well as text, logos, names and numbers on sport jerseys), but can be very detailed through the use of different fabrics, patterns and intricate embroidery. Dye Sublimation: This decoration method is best used when printing on white colored 100% polyester or other synthetic fabrics. This process uses specially formulated inks that are initially printed on coated heat resistant transfer paper. The paper is then draped over the flattened fabric/garment and heat pressed at around 375F. During the pressing of the garment at high heat the dye turns to gas, permeates the fabric and permanently bonds to the fibers. Custom Garment Dyeing: Garment dyeing allows for the alteration of a garments color to a desired specification. This customization technique has many applications such as creating custom garments for events and eliminating stock shortages of specific product colors. This is only recommended to be used on Prepared For Dye (PFD) garments that have not already been shrunk down to size. There are only a select few garments in our catalog that offer the option to do so. The following are the different garment dyeing techniques. The choice of what method to use will be determined by the desired result and garments fabric composition. Tie Dye: This is a specialized dyeing technique that uses one of the above dyeing mediums to create an irregular color pattern. Rather than dying the entire garment, portions of it are tied off shielding the garment dye from dyeing specific areas. While the resulting patterns will vary from piece to piece, the overall style and pattern can be controlled. Additional Note: Most of the time reactive dyes are best used for dark colors while direct dyes are most commonly used for light and pastel colors. This is a decision we will advise you on depending on the exact look you are trying to achieve. Fabric Treatments: the following are available garment treatments available. If you will be using white as a “color” in your garment dye line, garment washing is utilized to shrink the white garments so that the sizing is consistent with the product you dye.